Abbey Road Studios, London, England. The album debuted at #1 on the UK Albums Chart and was certified Silver in its debut week with sales of 63,500. The following five weeks, it registered sales of 35,147, 28,590, 29,647, 32,261 and 44,446, thus totalling 233,591 units in its first six weeks and landing at #2, #3, twice at #5, then climbing back to #3, respectively and earning a Gold certification. It is Elvis' 13th UK number-one album, making him the solo artist with most UK number-one albums (and overall only behind The Beatles with 15 number-one albums). Elvis also extended the record for most UK top 10 albums, with The Wonder of You becoming his 52nd top 10 album. 1 2 "New Elvis Presley Album The Wonder Of You: Elvis Presley With The Royal Philharmonic Orchestra To Be Released October 21 On Sony Music's Legacy Recordings". Legacy Recordings. PR Newswire Association LLC. September 8, 2016. Retrieved October 22, 2016. 1 2 "Official Albums Chart Top 100". Official Charts Company. Retrieved October 29, 2016. ↑ Jones, Alan (October 28, 2016). "Official Charts Analysis: Elvis tops the albums chart again". Music Week. NewBay Media. Retrieved October 30, 2016. (subscription required (help)). ↑ "Australiancharts.com – Elvis with the Royal Philharmonic Orchestra – The Wonder of You". Hung Medien. Retrieved November 5, 2016. ↑ "Austriancharts.at – Elvis with the Royal Philharmonic Orchestra – The Wonder of You" (in German). Hung Medien. Retrieved November 3, 2016. 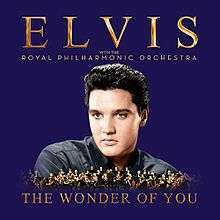 ↑ "Ultratop.be – Elvis with the Royal Philharmonic Orchestra – The Wonder of You" (in Dutch). Hung Medien. Retrieved October 29, 2016. ↑ "Ultratop.be – Elvis with the Royal Philharmonic Orchestra – The Wonder of You" (in French). Hung Medien. Retrieved October 29, 2016. ↑ "Elvis Presley – Chart history" Billboard Canadian Albums Chart for Elvis Presley. Retrieved November 1, 2016. ↑ "Dutchcharts.nl – Elvis with the Royal Philharmonic Orchestra – The Wonder of You & If I Can Dream" (in Dutch). Hung Medien. Retrieved October 28, 2016. ↑ "Lescharts.com – Elvis with the Royal Philharmonic Orchestra – The Wonder of You". Hung Medien. Retrieved October 30, 2016. ↑ "Offiziellecharts.de – Elvis with the Royal Philharmonic Orchestra – The Wonder of You" (in German). GfK Entertainment Charts. Retrieved October 28, 2016. ↑ "Charts.org.nz – Elvis with the Royal Philharmonic Orchestra – The Wonder of You". Hung Medien. Retrieved November 4, 2016. ↑ "VG-lista - Topp 40 Album uke 46, 2016". VG-lista. Retrieved November 19, 2016. ↑ "TOP 100 ALBUMES — SEMANA 44: del 28.10.2016 al 03.11.2016" (in Spanish). Productores de Música de España. Retrieved November 11, 2016. ↑ "Swisscharts.com – Elvis with the Royal Philharmonic Orchestra – The Wonder of You". Hung Medien. Retrieved November 2, 2016. ↑ "Elvis Presley – Chart history" Billboard 200 for Elvis Presley. Retrieved November 1, 2016. ↑ "Elvis Presley – Chart history" Billboard Top Classical Albums for Elvis Presley. Retrieved November 1, 2016.